Just as important as you preparing your skin to get that flawless texture that you want, is ensuring that you take off all the make-up that you applied. It's a circle if you leave your make-up on while you sleep your already not preparing your skin for the next day as I'm sure it will be more of a hassle. Some people ( like myself ) break out with a rash texture sometimes or a spot if I end up asleep with my make-up on. Other's are fortunate enough but it's never a wise idea to sleep in your make-up. 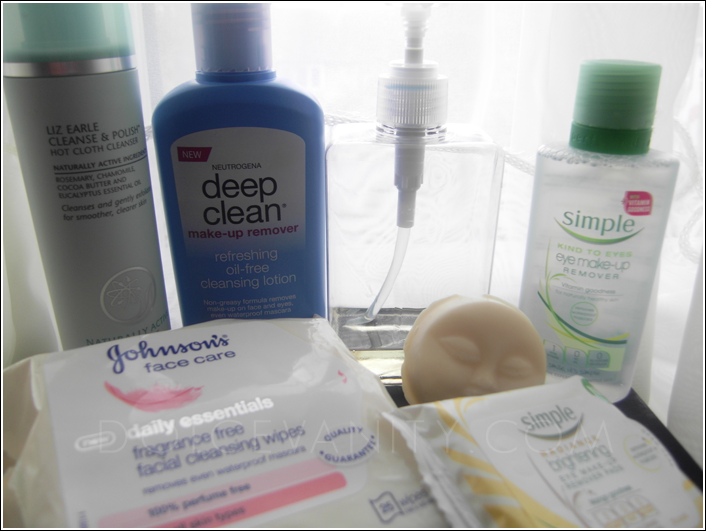 There are so many ways to get make-up off and I'm going to share with you some of the ways I ensure that I get off the daily grime. Liz Earle Cleanse & Polish - Hot Cloth Cleanser. I've previously done a review on the Liz Earle skincare and as this is to help take off your face & eye make-up along with the cloth I find it a great product to have in a routine and it's quite moisturising for my skin. It's a fantastic cleanser I have notice that my skin has improved and you notice all the dirt and makeup being wiped off on the muslin cloth. 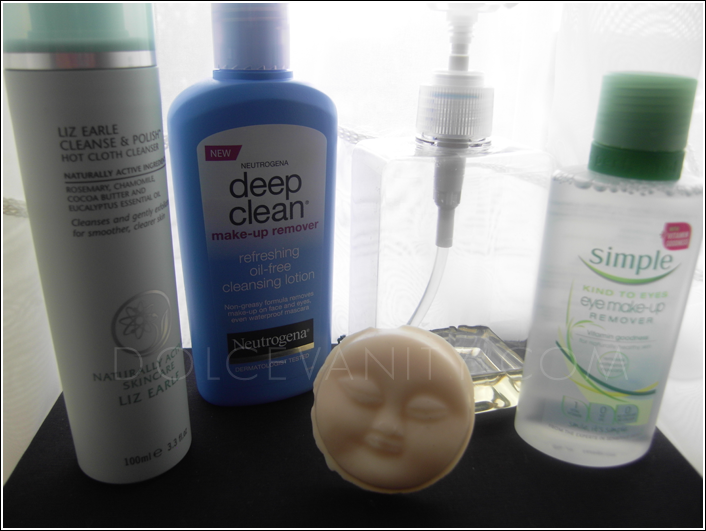 Neutrogena Deep Clean Make-up Remover - Refreshing Oil Free Cleansing Lotion. I heard fantastic things about Neutrogena's oil free range and especially this make-up remover. I read and watched a handful of reviews and yes it does remove that stubborn make-up especially waterproof. Yet it does sting -for me when it got into my eyes. Simple Kind To Your Eyes. Eye Make-up Remover. Disclaimer : I did not purchase this product. I won it in a giveaway. Lush Babyface Cleanser. This soon to be discontinued cleaner became my HG since I started using this a couple of months back my skin has cleared up amazingly and it's kept that way all I have now is just discolouration from where the spots use to be. I love the soft texture and smell of this cleanser. I'm going to be devastated to see it go. It cleans my face and make-up off wonderfully and leaves it feeling and scented gorgeous. Yet a lot of the time it's habit for me to just reach for some good old fashion wipes!! 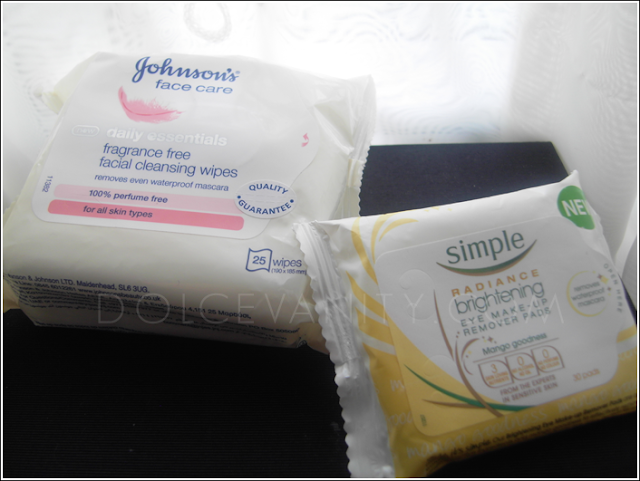 Johnson's Face Care -Fragrance Free Facial Cleansing Wipes. Out of all the wipes I've used and I've used a lot of different wipes & brands these have to be my favourite. The cloth is soft and it doesn't dry out my skin or irritate while taking off my eye make-up. Most importantly for me is that it is fragrance free. Sometimes I use certain wipes and they are watery which I hate. These are perfect & I think I have found the wipes to repurchase. Simple Radiance Brightening Eye Make-Up Remover Pads. I'm not a fan of 'remover pads' just for the eyes as when I take off my make-up I like to be able to use just the one item, not saying that you can't use it to take off the rest of your make-up but being that it's a small pad you will go through a lot to take off most of the make-up. I like these as they are non-drying even though it says mango goodness on the packaging there is no trace of fragrance. Neither does it irritate. These are good for travelling but I'm not sure if I was to solely purchase these to use daily as they wouldn't last long. So that's how I take off my make-up !! What do you use to take yours off ? Im exactly the same as you, if I don't remove my make up GAURANTEED the next day I will end up with a couple of spots. I did it last Wednesday, crashed out with Harvey while laying with him to get him to sleep and stayed there all night lol. The next morning my skin was a mess and Ive still got the spots now. I was doing so well as well. My skin has been perfect lately. @Jo oh no!! At least you slept in the make-up for a good cause not due to laziness lol. That is the worst when your skins been so perfect and then a little sip up can ruin it. Grrr ! !